The greatest trip of my all life was in Japan. I loved it. I love it so much ! Hiroshima, Osaka, Kyoto, Nara, Hakone and most of all Tokyo. What a city ! Gigantic with so many stuffs to do ! Theme bars, food, so yummy, everything was perfect. Almost, because sometimes we had no idea of what we were ordering or buying in the supermarket. Sweet, salty not always what you expect ! And … Matcha green tea almost everywhere !!! 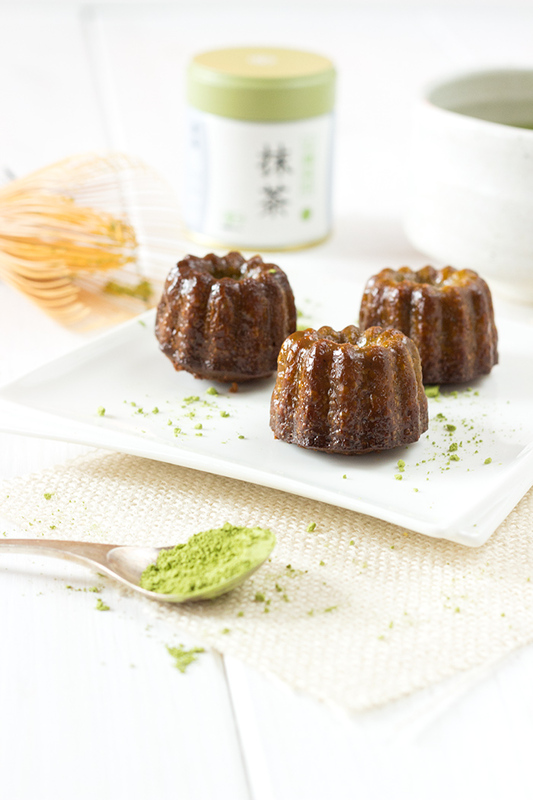 Ice cream, milkshake, cake, … So I have decided to share with you a French speciality made with a green japanese touch ! 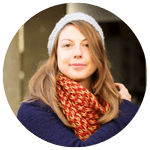 I hope that you will enjoy this recipe ! 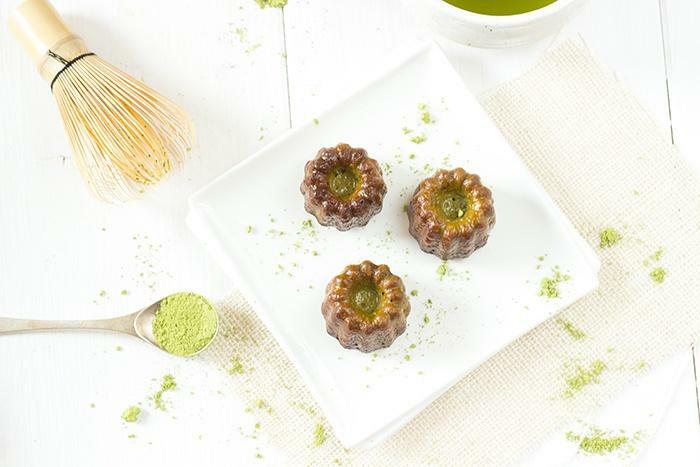 But to make Matcha green tea cannelé recipe, you have to find some matcha tea. Not all of them can be use for cooking, some of them are just to good and must be drinken in a large bowl of hot water. 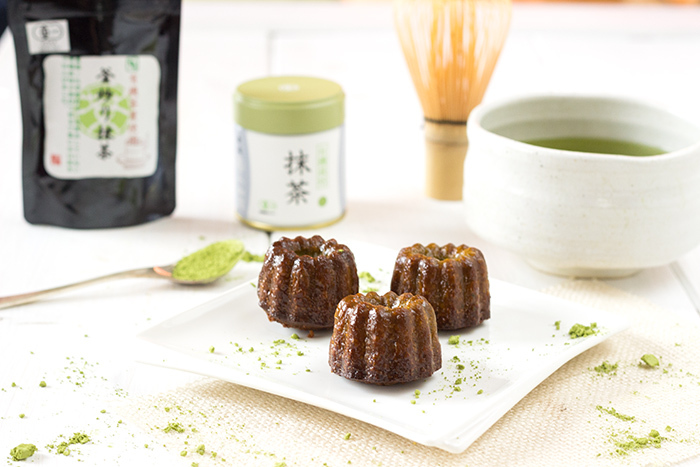 I found my matcha tea here, in this great online shop Grace & Green. Products are shipped directly from Japan, wrapped up in some authentic japanese newspapers ! I use the “Healthy Green Tea Powder” to cook and the “Regular Matcha” to drink ! My acupuncturist told me that green tea was better than black tea and that I should drink it more. So after replacing white flour by spelt flour, I drink green tea ! Bring milk to a boil together with seeded vanilla pod. Melt butter in this mix and reserve. Mix sugar, flour and eggs in a large mixing bowl. Add warm milk little by little. You will get a dough looking a bit like a pancake dough. Add green matcha tea. Refrigerate at least one hour and up to 12 hours. Preheat oven to 250°C. Butter molds with the melted butter using a kitchen brush. 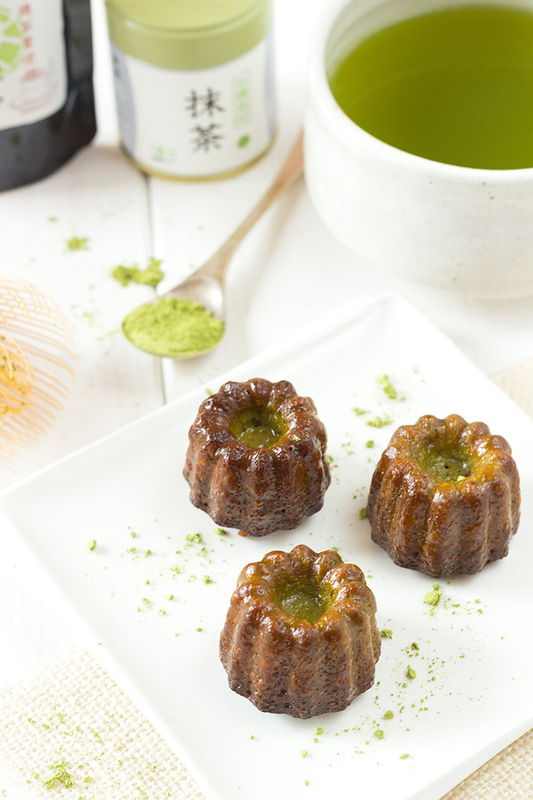 Fill molds no more than ¾ because your canneles will rise. Bake for 10 minutes. Low temperature to 180°C and bake for another 50 minutes.